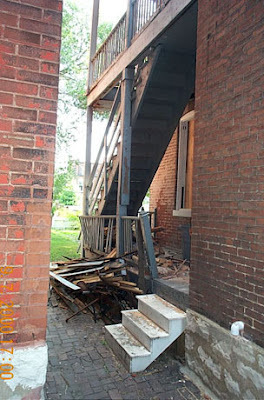 We rebuilt the back porch (and balcony framing above) many years ago. 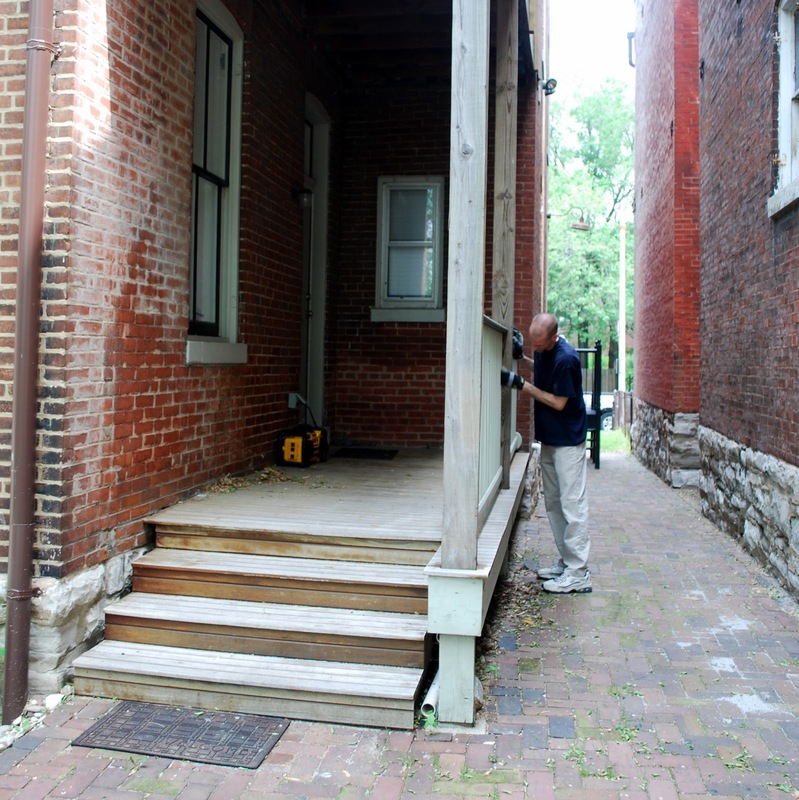 The structure of the porches is pressure treated wood, and the railings are fir. 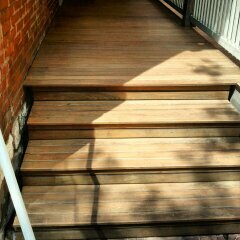 The deck itself is ipe, a very dense, tropical hardwood that is extremely durable, and absolutely gorgeous when maintained yearly. 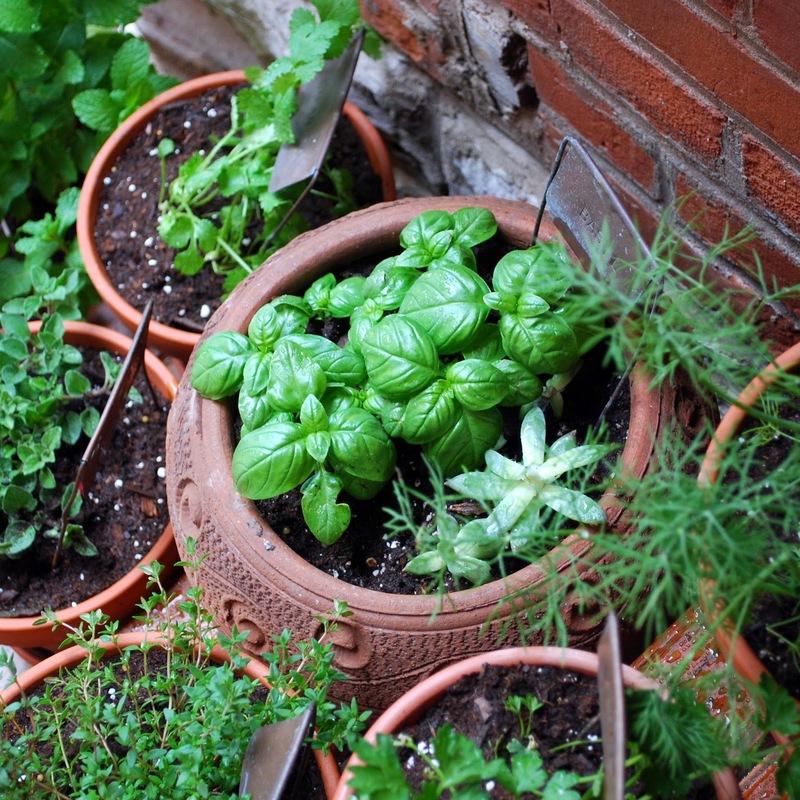 We did that right on schedule each spring for the first few years, but we let it go last year, and maybe even the year before that, so it was long overdue. …as well as all those railings. It had been at least eight years – maybe more – since we had stained those the first time, so they were in need of a freshening up as well. 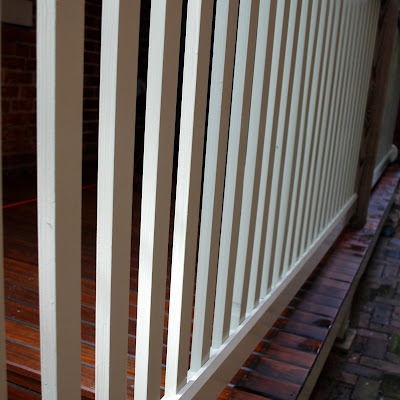 The top rail has a semi-opaque Cabot stain in an inky black, and the vertical rails and the bottom rail have an opaque Cabot stain called Juniper. We had leftovers of both colors, but the Juniper stain was hardened into a brick in the can, so we had to track some more down. We still haven’t finished the upper balcony – which we would like to make a screened porch – and when we do that we’ll trim out the vertical columns at the same time. Right now they look sort of plain next to the rest of the finished porch, but they do the job they are supposed to – and they are a far cry from the porch we found here when we bought the house. 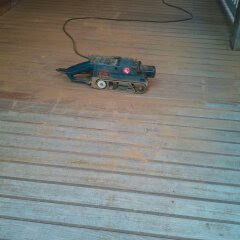 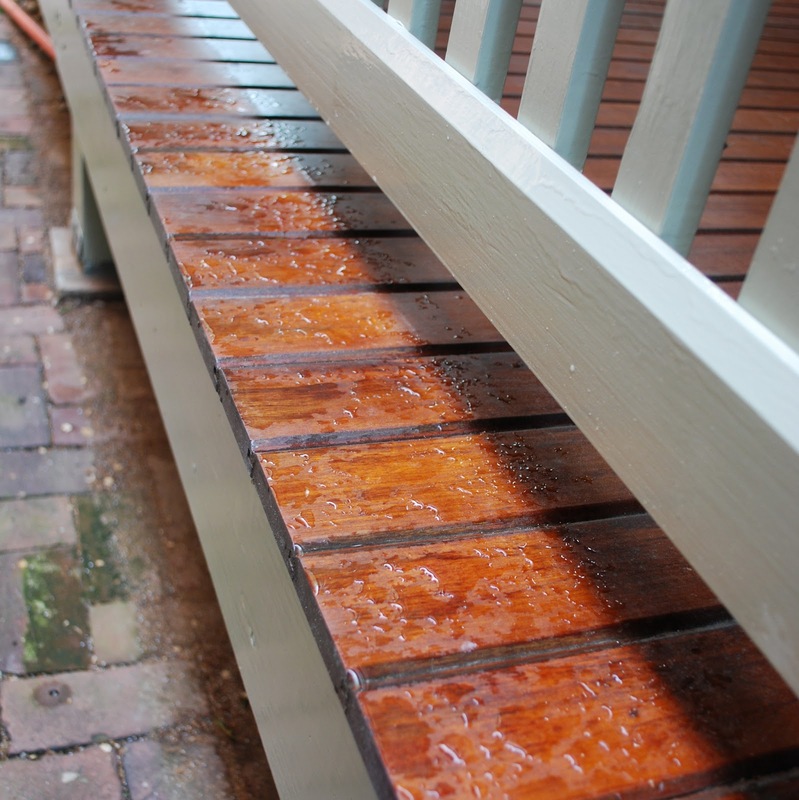 The sealer on the deck really brings out the beautiful color of the wood, and the water just beads off the surface. 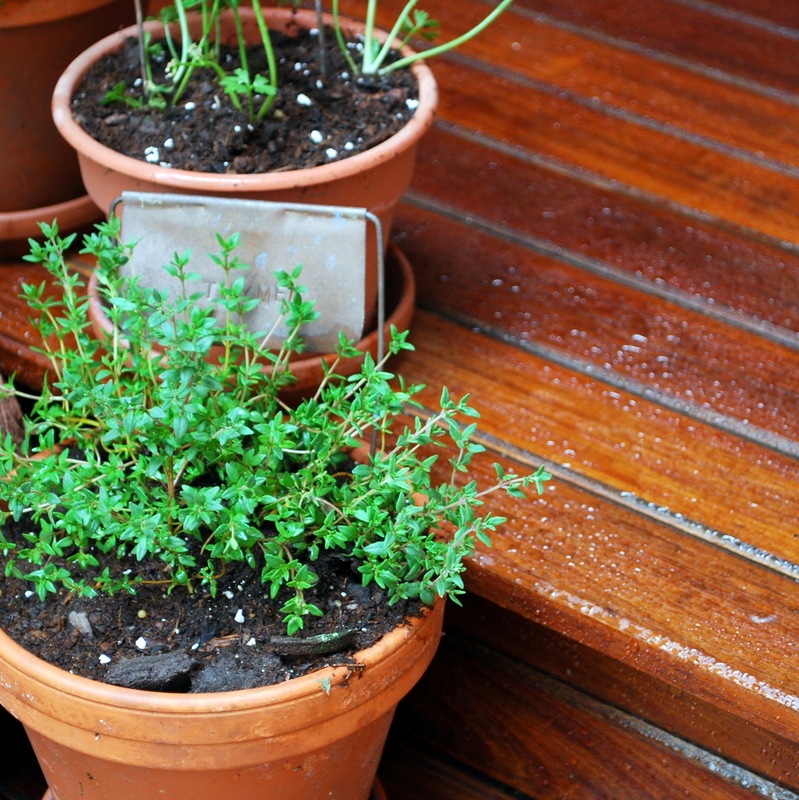 So now the herbs are out, and the deck looks alive again, and it just might be summer soon around these parts.